DeWalt, a renowned brand for hand and power tools, is all about finding world-class solutions to the problems that face the construction and manufacturing industry. With their remarkable experience of over 90 years, you can depend on every DeWalt product to do what it is intended. 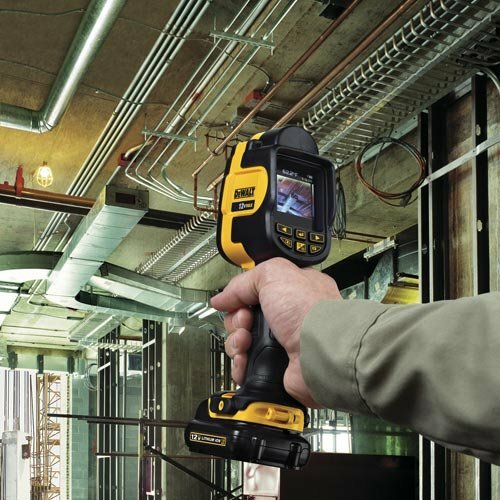 When it comes to seeing the unseen, this brand gives us their most remarkable cheap thermal imaging thermometer; the DeWalt DCT416S1 Max. A tool designed for HVAC technicians, electricians, maintenance personnel, and homeowners, it helps you make better maintenance and repair decisions saving you time and money. 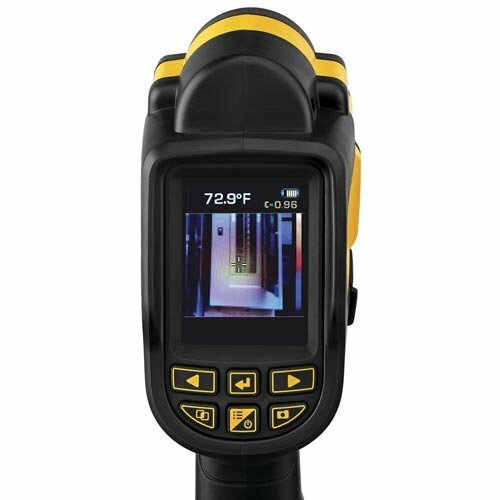 You can also see our full list of cheap thermal cameras for more options. 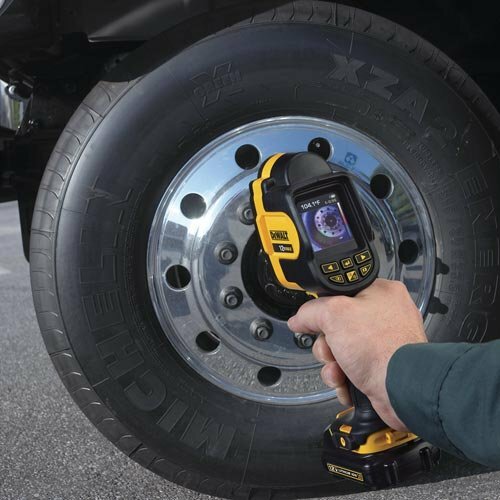 This thermal imaging thermometer uses DeWalt’s very own thermal imaging technology. It can combine a visual image on top of a thermal picture to help get more precise details. It does not have the refinement presented by other thermal cameras like FLIR’s MSX technology. But we understand that’s why it’s cheap, and it is ranked as a thermal thermometer. With a visual photo embedded in the image, it’s possible to tell the location of the surface, and the precise details that help communicate ideas. It boasts a temperature detection range from 140F to 4800F. This means it can operate in a wide range of applications. From looking at pipes under a floor to testing the high temperature on hot industrial equipment. Now you don’t need to be dangerously close to measure temperatures because it is a non-contact thermometer. Not to mention, you can measure all the scenes of a surface in one image. It is remarkable since it is highly sensitive to let you compare different temperatures. These are accurate and repeatable results that allow you to maintain a high standard in your workplace or inspections. Improve your accuracy by adjusting emissivity on this device. By entering a measure of temperature on the thermometer, it is much easier to identify objects by comparing the nearby elements like red and green wires in a circuit box. Emissivity is adjustable with increments of 0.01. When it’s in your hands, there’s the confidence you get when you know the temperature of a particular surface. It gives you enough contrast around an image and its background making it easy to recognize what you are looking at. With a 2.2-inch LCD, it is easy to see why knowing the details of an image is easy. This imaging thermometer has a color screen with different palettes representing the temperatures of the surface. As such, you can tell the hot from the cold spots fast and easy. And since the thermal image is blended with the visual image, you will be able to clearly see the details. Coupled with a 20-degree field of view, it is remarkable how much of an image you can see so that you don’t take more pictures of the same surface. This way, it’s easy to compare the temperatures of different areas. 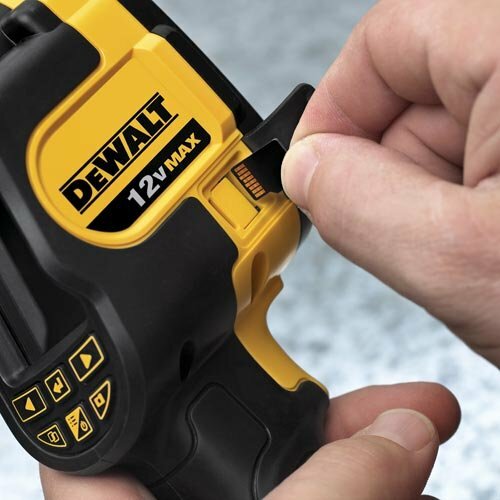 If you wish to compare images, the DeWalt DCT416S1 lets you store your data onto a micro SD card. Whether it’s a thermal image, a visual, or blended photo, you can save and look at them later or with your clients. You can transfer the images onto a laptop where with the help of DeWalt’s reporting software, you can analyze and document your findings. If your client is a large organization, you can quickly present your findings, so that everyone will understand the reasons behind the recommendations you make. It comes in handy in applications such as electrical inspections, energy audits, and preventative maintenance. It can also play a role when initiating insurance claims. In any thermal imager, loving the way it feels in your hands influences your work in a big deal. Fortunately, the DeWalt DCT416S1 is a lightweight device that is simple to operate. You can use it for extended periods without strain. With only five keys, it is straightforward to select a function. Every control is right at your fingertips, and you will find the contoured hand grip comfortable even with gloves or wet hands. The DeWalt DCT416S1 is equipped with a 12V Max Lithium-Ion battery. It matches its environment of use as we expect a running time of up to five continuous hours. If you are going to use it for just a few minutes every day, we can see you working with it for weeks. What’s more, this thermal imager comes with a fast charger. If time is not on your side, 40 minutes is all it takes to have a full battery to get back to work. The battery can also be switched out for a newer one either for replacement in the field or if it has outlasted its usefulness. DeWalt is known for their impeccable customer support. 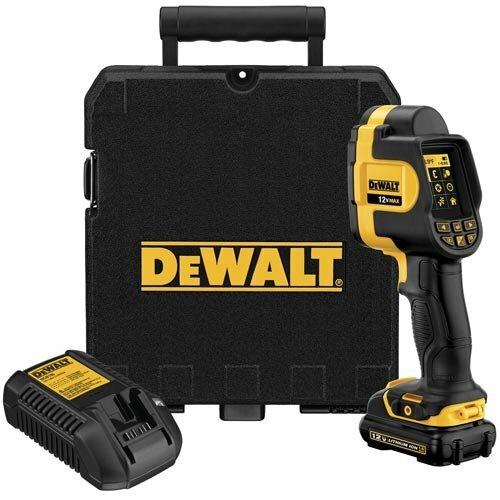 If the DeWalt DCT416S1 thermal thermometer has a manufacturer’s fault, DeWalt will have it repaired for free, as their 3-year limited warranty covers it. During the first year, Dewalt offers to repair and service your thermometer for free under its one-year warranty for normal use of the device. And, if for any reason, this imaging thermometer does not meet your expectations, you can return it under their 90-day Money Back Guarantee. There’s no doubt that the DeWalt DCT416S1 is a simple thermal thermometer. It does not boast the highest resolution or the most advanced features that’s why it will not take center stage in most professional settings. It is the tool you want if you perform routine checks from time to time and do not want a device with with many additional features that you will rarely use and increase the price. You do not need that much experience to use the DeWalt DCT416S1. As such, if you are starting out in thermal imagery, more so measuring temperatures, we say; go for it. It may be the best equipment for your toolbox.